The Resort completes a website makeover just in time for Colorado summer vacation planning. We wanted to showcase all that the resort has to offer -- cabin rentals, rafting, a zipline, bicycling, and more. Glenwood Canyon Resort recently unveiled a new website, which went live on March 22nd. The new site, created by Sjoberg Design, is designed to be easier to use, faster loading and better for showcasing all that the resort has to offer -- cabin rentals, rafting, a zipline, bicycling, and more. For Doug Davis, the Sjoberg Design partner who managed the technical aspects of the redesign, faster loading and easier accessibility were priorities. “We wanted to make the new site friendly for both users and also the search engines, and to have compatibility with all modern browsers. In taking on this redesign, our biggest challenge was to convey a large amount of visually graphic information while delivering the site pages quickly,” he said. "Thanks to the design work of our lead graphic designer, Alice Sjoberg, we feel that the site does a great job of conveying the gorgeous setting of the Resort," Davis continued. With winter turning to spring and warm weather already here, it’s the perfect time to release the new website, making it easier for people to start planning their outdoor adventures and Colorado summer vacation. Be sure to visit the new website at glenwoodcanyonresort.com to plan your own excursion! 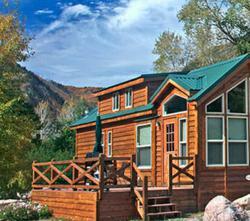 Glenwood Canyon Resort is located near Glenwood Springs, CO and offers lodging as well as a number of activities. Lodging includes mountain cabins with full kitchens, RV sites, tent sites and deluxe suites. Activities at the resort include whitewater rafting, a zipline across the Colorado River, biking, and more. Glenwood Canyon Resort also offers an award winning Canyon Club Event Center for weddings, family reunions and other group gatherings. Food and drinks are available at the onsite No Name Grill. Call (970) 945-6737 for more information.